When apples and pears are in season from autumn into winter, I keep a large bowl on the countertop for out-of-hand eating. I also love to poach them to transform them into this luscious dessert. ON-DEMAND: Listen to Faith and Lucinda talk about this recipe—as well as many others—and learn more about the book, Mad Hungry Family. 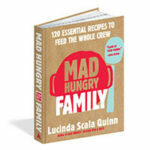 Excerpted from Mad Hungry Family by Lucinda Scala Quinn (Artisan Books). Copyright © 2016. Photograph by Jonathan Lovekin. Combine the apple cider, vermouth, butter, star anise, and salt in a large skillet with a tight-fitting lid. Bring to a simmer over medium-high heat. Add the pears, reduce the heat, and simmer, covered, until the pears are tender when pierced with the tip of a knife, 8 to 10 minutes. Whisk together the yogurt and honey. 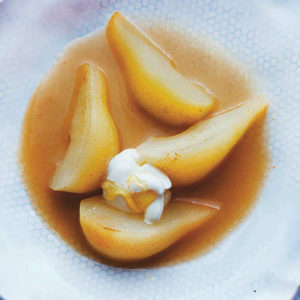 Divide the pears and poaching liquid among four bowls and serve topped with a dollop of honey-yogurt and the cookies, if desired.